We can have our specialists install high security Grade 1 locks, in a variety of price ranges and types including locks with extra-long bolts, reinforced plates, extra-long screws, and anti-pick pins to give you extra protection and the highest security possible. These locks have the Highest Grade Security on the market and the strongest grade ANSI recognizes for any residential or commercial product. Locksmith Bee can install and repair mortise locks for residences and businesses in local areas. Working on this type of highly security, complex lock remains one of our specialties. Due to the complexity of the work involved, mortise locks require the assistance of a trained expert to install correctly. The lock mechanism remains entirely concealed with a narrow cavity, or “mortise”, rendering this type of lock much harder for anyone to break open. 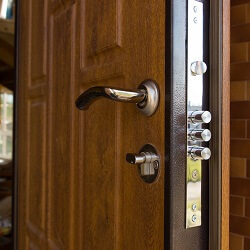 For this reason, this lock provides excellent security.In most parts of the world, mortise locks are found on older buildings constructed before the advent of cylindrical locks, but they have recently become more common in commercial and upmarket residential construction in the United States. Many security professionals prefer it over other types of locks widely available on the marketplace today. It also generally requires expert installation.We carry finishes that include brass, aluminum, steel, chrome, and nickel. With many attractive styles available today, a mortise lock can significantly enhance business security, and mesh well with decorative requirements! Our licensed, bonded, and insured company maintains an impressive 30 minute response time to initial service call requests.